Home Pro TIps How Many Times Should You Follow Up with a Lead? How Many Times Should You Follow Up with a Lead? A common question that comes up in sales is, how many times an insurance agent should follow up with a lead before the lead becomes a lost opportunity. While every sales process differs, Hometown Quotes was interested in finding out what insurance agents believe and practice in their current sales processes. In a recent poll published on Hometown University, we asked a group of agents, “How many times do you follow up with a lead before it becomes a lost opportunity?” Rather than identifying one response as a clear winner, out of 42 respondents, our polling results were highly divided. Tied for first, was an even split between 3-5 times and 6-7 times. See chart below for polling results details. Not only that but for the sales representatives who do follow up, they only make 1.3 call attempts before calling that lead a lost opportunity. These statistics illustrate a tremendous opportunity for insurance agents to increase their overall contact rate and revenue. 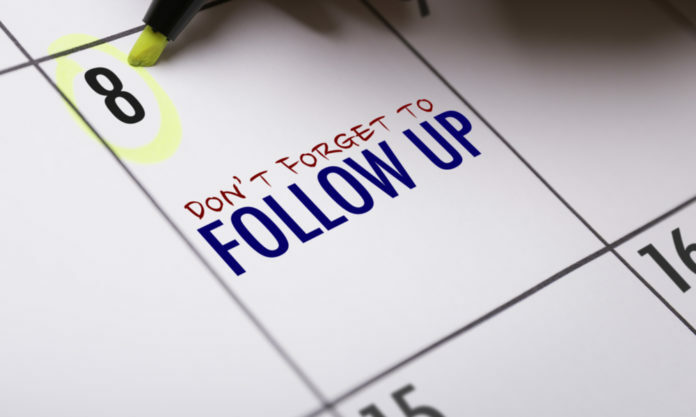 So now that we know the average number of initial follow up attempts made by sales representatives, how many times should a sales representative follow up with a lead before it becomes a lost opportunity? 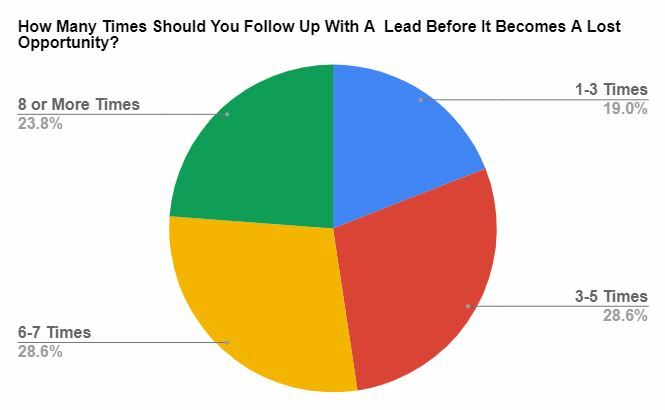 Research by Inside Sales emphasizes the great significance of follow up persistence and how most sales representatives give up on a lead too soon. Based on their research, Inside Sales recommends a minimum of six points of contact. Based on the results of our poll and evaluating industry best practices, we recommend following up with a lead a minimum of six times. However, the opportunity to work with a lead is never ‘lost’. Even in the chance that you are unable to connect with the prospect within the time you have allocated in your sales process, there is always another opportunity to sell in the future. As an agent you need to view leads as a long-term investment, and while you may have missed the opportunity to sell to a lead today, you can always reconnect with the lead down the road and see if their insurance wants and needs have changed. As an insurance agent, we know your time is valuable and finding the time to follow up with each lead six or more times can seem daunting. But with the right tools and strategy in place, you can push yourself to be a more successful agent. Create a lead management and response process that clearly lays out how your leads should be treated and how often they should be followed up with. Next, try implementing a Customer Relationship Management (CRM) or Sales Automation tool that will help you manage your day-to-day activities and lead nurturing process. Finally, always take the time to measure the results of your sales processes, so that you can have a clear understanding of how these processes are impacting your overall sales and growth. As agents helping agents, we want to see your agency grow. If you have any questions about how you could improve your current lead and sales process, reach out to us at 1-888-808-6007 or click here.